I have to live on whatever I get from begging.” Khatun Begum is another one like Asgori Begum. She even doesn’t know her age. But she guessed no less than 80. For running her life she has to depend on a tiny shop. Hafsa Begum passed 60 long ago. For managing bread and butter for two times a day she works as a maidservant. But this is not enough to feed her family. In addition she prepares paper-packets. Approximately 45 years of Amena sometimes crushes bricks, sometimes climbs up to the top of under construction high-rise buildings with the concretes. 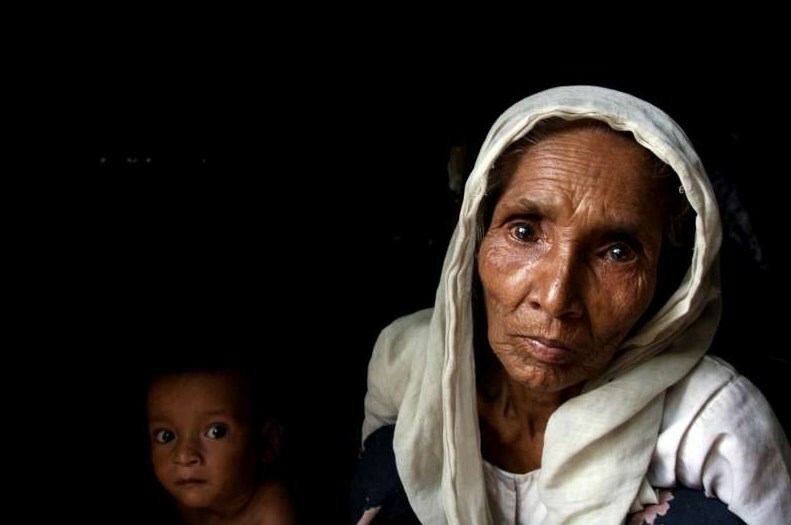 Not only Asgori, Khatun Bibi, Hafsa and Amena, there are hundreds of refugee women passing their lives in grief in Sardar bahadur Non-Bengali camp under Pahartali thana of Chittagong. Maximum of then are widows. There are few who don’t have any kin and kith. They don’t have the ability to earn their minimum basic needs. They don’t know what are rights of human rights. They even don’t try to know. All they are Non-Bengalis. They are known as Bihari. There are 7 refugee camps or colonies is Chittagong City. Pakistani Bihari people those who were stuck up during Bangladesh Liberation war live in these colonies. Minimum of 35 thousand Non-Bengali live in these colonies. 55% of them are women. These refugee women live in the colonies of Halishahar, Hamjarbag, Roufabad, Shershah, Sholokbahar and adjacent area of Pahartali wireless colony. Among them 15 thousand are women. The number of widow and old women is not few. They are living a very pathetic life. There is no healthcare service for them. They have hardly any source of income for their living. They almost live in the open field. They live on what ever they get from begging. There are 11 sectors in Pahartali Bihari Colony. Zamila Khatun (68) lives in lane no. 4. Showing her torn clothes she was wearing she said “leave alone the clothes, we have to eat two times na! If any one mercies we eat otherwise not.” “If the government allotted us the welfare allowance for old we would not famish.” She added. Like widow Zamila Khatun there are 7 to 8 hundred old, indigent widows in Pahartali Sardar Bahadur Colony. Another widow Jobeda (50) said “Bangladesh government has given us the citizenship. Now if the government allots us food in exchange for work we might be able to reduce our hassle.” Octogenarian Mashrufan Begum informed that her body is afflicted by different diseases, but she has no money to go for a doctor. If there were a tiny clinic for all the Biharies she could go there for treatment. After the current government had taken over, Jatindra Lal Tripura, MP of Khagrachari, was appointed as the Chairman of the Taskforce for identifying and Rehabilitating the refugees returned from India. When he was asked regarding the rehabilitation of Refugees he said, “I have got the assignment of rehabilitating the refugees of the Chittagong hill tracks. I know, the matter of stuck up Pakistani refugees is also very important. I will discuss the matter in Parliament.” He added “This government believes in protecting human rights, the government will take action for ensuring all’s human rights. About to UNHCR, refugee related wing of UN, and Refugee International, the number of stuck up Pakistani Refuge is around 150 to 200 thousand. They live in 66 camps of 13 areas of the country with inadequate healthcare service, insufficient sanitation and very densely in clumsy places. They have got citizenship of Bangladesh by the order of the high court in May 2008. It is know that 500 thousand Pakistanis were stuck up at the time of liberation war. In 1976, by the aid of International committee of Red Cross (ICRC) 175 thousand got back to their country. Later on, because of many difficulties, rest of the Pakistanis could not return to their country. They had been getting aid in the period of different government, they had been getting relief too. Adults and children below 12 years used to get 3.023 kg and 1.510kg wheat a month respectively. But, since January 2004, due to unknown reason the relief has been stopped. Earlier they used to get mutton from Saudi Arabia. College student Md. Ismile Arman of lane no. 2, Pahartali Bihari colony informed that the allotment of mutton has also been stopped. He added “Once we used to get relief, now we don’t, different people say different things, but I understand that we are refugee, so we don’t have any rights. Wherever we go people say that the matter of Bihari is different, language is different and the judgment too.” Arman added further “There is no healthcare and education facilities, place for accommodation is too inadequate. We are given citizenship but not the civic rights. Though there are gas, electricity and water facilities in the surrounding areas of the Bihari colony there is no such facilities in the colony. Lack of all these facilities added more to the sufferings of women. Visiting the refugee camps it is seen that there is lack of safe drinking water, the condition of sanitation system is horrible. Even a medium rainfall brings their huts under water. They live densely in clumsy unhealthy environment. They have to pay 800-900 taka a month for a slum of 60-70 Sft. The inhabitants of 2000 quarter of Sardar Bahadur Camp have to depend on a maiden common bathroom built 30 years ago by the ICRC. Presently Dustho Shastho Kendro (DSK), an NGO, set 4 community Latrine there. In this regard, DSK officer Shahmim Mosharof Shilpy said “DSK has set 4 community latrine under a sanitation project, water limes have been set from WASA. Because of dense population so many thing are not possible to do. Besides this, because of the illegality it is difficult to do something positive for them.” M.Z. Azam, genaral secretary of Sardar Bahadur Non-Bengali Governing committee, said almost same thing. He said, “we are deprived of many rights. As we are non-Bengali no organizations comes forward to helping us. There is no healthcare service. Sanitation facility is very poor. Overall environment is very dirty. So, diseases are frequently visiting guests to the colony. Children and women are the worst sufferer of them.” Azam said further “ICRC constructed a common Bathroom, but it has been unable to take the load of increasing number of population. Women, here, are living pathetic lives because of insufficient facilities. Their sufferings is beyond description. There is no scope of doing something for them on behalf of the committee because we don’t have fund. Being non-Bengali our committee hasn’t got the approval, as a result don’t get fund.” Local ward councilor Md. Hassan Hiron said, “Welfare allowance for the old Bihari women is under process, besides this whoever comes to me I help him or her my level best.” He added “whichever country they might belong, first of all they are human being. Everyone should come forward to them with humanity. After discussing with many Bihari women it is known that, as they are Bihari maximum Bengali people hate them and don’t offer any job opportunity. They are socially degraded. Because of poor economic condition they are deprived of education, as a result they are not able to attain any good profession. For the survival Bihari women are often compelled to adopt prostitution as a profession and their next generation is failing to return to the natural life.